Last summer when I was in Anacortes, Washington, I often passed a sign on the road for Lovric’s Sea-Craft, Shipyard and Marina. From the elevated road it’s hard to see the marina itself because it’s down a steep slope and obscured by trees. But the bits I saw were intriguing — a tangle of boats, big and small, as well as a massive structure that seemed to be a shipwreck covered in trees. One evening when I had a bit of time I parked nearby and went down to investigate. Turns out the shipwreck is an old schooner that’s been turned into a breakwater, but what I found incredibly beautiful was the end-of-day light on the other boats. I finally have a bit of time to work on a painting of the mysterious Lovric’s. The planning stage of a painting is always the most exciting part of the process for me. When I have the time I like figuring out the values and the colours in advance so that when I get to the bigger painting, the direction has been set. I started with a small pencil value sketch where I blocked in the lights, darks and mid tones. 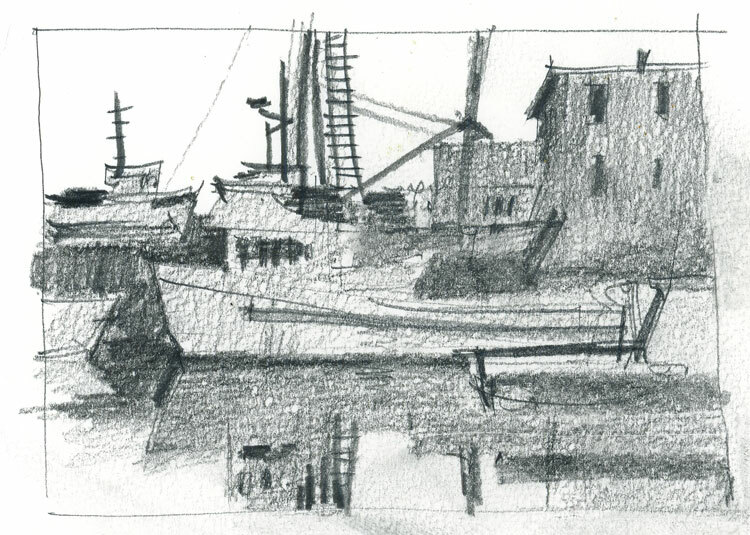 What’s unusual for me in this particular sketch is that the lightest areas are the sky and the water instead of the boats themselves. The second part of the process is often to go straight to a bigger painting, but for this one I want to be sure that I get the colours right. The boats are all in cool shadow but the setting sun is warming up the buildings in the distance, so the play between warm and cool is important. The colour sketch isn’t much bigger than the value sketch — it’s about 8″ x 10″ — and it isn’t very detailed, but I hope it will be my roadmap for a bigger painting sometime soon. I also want to add a clarification to my post from yesterday about Arches paper. My disappointment with my sketchbook paper was only with the stock in the book. I use single sheets of cold-pressed 140 lb. Arches, both Natural White and Bright White, and it’s a very high quality paper. No complaints about that! Wow, it’s a beauty Shari! Shows the value of planning. Thanks Tracey. I don’t always have the luxury of time but when I do, it is tremendously valuable. I love it when art succeeds beyond everyday rules. In high school I belonged to a Madrigal singing group. It was always fun to hear the altos end a song on a higher note than the sopranos. I see the same thing in your colour study – colour theory says warm colours advance and cool colours receed. The sunset in your sketch trumps all and this is a very happy break from the rules. Great drama! Hi Shari! I’ve been following your blog for a while, but haven’t popped in since I am reading it on my phone, but I wanted to comment and let you know that I’ve been enjoying all of your posts, and love your work. Thanks for the inspiration! Thanks so much fro writing and letting me know Jennifer. It is appreciated. Your mock up painting is already pretty great! Thanks for sharing your process. I recently did this with a painting and it really worked. It’s a good reminder to work out some values and color in advance! Jean, I’m glad to hear that you tried this too. I’m a big believer in planning although often guilty of not doing it myself and hence wasting plenty of sheets of expensive paper. How wonderful to see your value study and sketch from Lovric’s! I drive by almost every day, but have never been down there! Their son was in my classroom years ago. Maybe he’d give our sketching group a tour! Thanks for the inspiration! Hi Missy. This would be a great place to go with a sketching group. In fact, there is so much there that you could paint for a whole week. How about if I give a workshop there this summer? 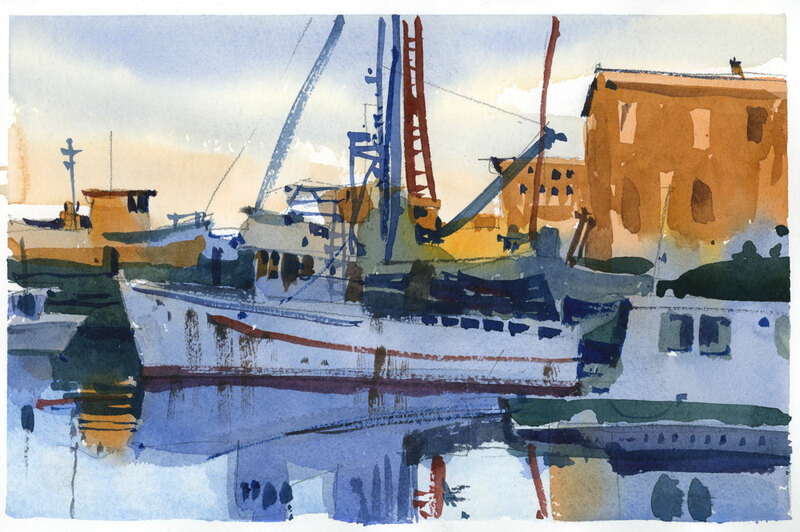 You know how much I love painting boats so we could just set up there every day. Hope to see this finished! I hope to soon have time to finish it Dee. Love it as is. Has a spontaneity that gives it life! Thanks. I hope to be able to keep that sponaneity in the final! Each day is a learning day for me watching your site. It is not just theory. We can see how this value sketch anticipate the coloured one. And I can not see how this colour sketch could be more charming! Like a rock or jazz improvisation marvel that you cannot replicate with the same freshness and spontaneity in studio ! Each day that I paint is a learning experience for me too Richard. 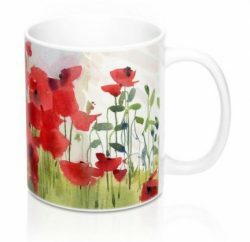 Watercolour is like that and that is one of the joys of painting with it. Such a beautiful color sketch! Not sure whether it is worth commenting here as it seems that you have given up on the idea of replying to comments… I will try anyway. Do you think you would be able to do a bigger painting based on this one (as you suggested above) and not loose the lovely looseness and lack of detail that you have achieved here? That is always the hope Ross. I would love to do a full sheet of this one (22″ x 30″) but I may just end up doing a half sheet. Either way, I would love to maintain the looseness of this one. Tom Hoffmann always says “Keep it abstract as long as possible” and I think that is the trick with this.